What is a Silent Witness Exhibit? Thank you for choosing to create a Silent Witness Exhibit for your community. For the past twenty years, the Exhibits have been the most powerful way to honor those whose lives were lost in acts of domestic violence and to begin the healing process through awareness, education and treatment programs in hundreds of communities across the America and several other countries, worldwide. The Exhibit is a visual representation consisting of life-sized, red laminated silhouette's of the women, men and children murdered in acts of domestic violence during a specific period of time within each state, county or city. The year or geographic location you choose is the beginning of a memorial to those who lost their lives due to domestic violence perpetrated by a spouse or former spouse, partner or former partner, parent, step-parent, relative or known person. Once you have determined the demographics of your exhibit, invite other's to join a committee. The goal of each Exhibit is to create an engaging display that will rally community support to grieve the losses of human life, create awareness and education materials and programs by collaborating with concerned and passionate members of your local community. You can have an exhibit any time of the year that it is needed. In addition, there are also some months that fit especially well with having an exhibit. How Do You Pay For a Witness? On average, it costs about $100 per witness to create them. 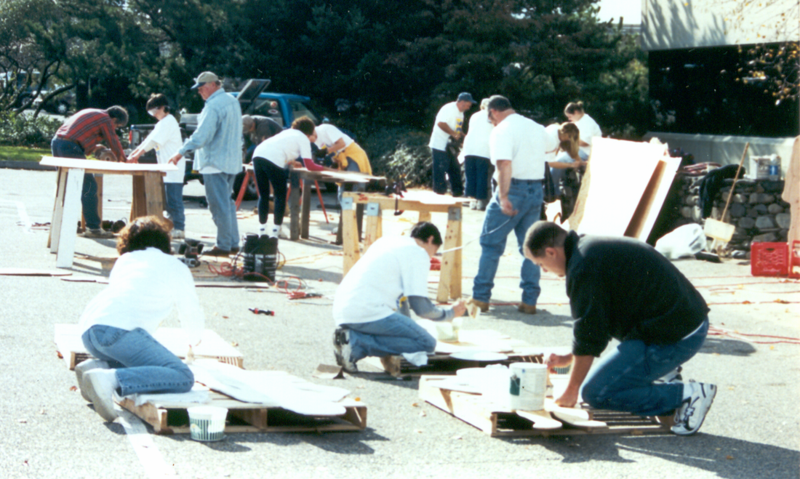 This includes the materials to build the witness such as plywood and paint, and promotional materials such as creating banners, brochures, luminary candles, and program book. While it might seem overwhelming for inexperienced fundraising, the reality is anyone can obtain the resources needed. We have some great ideas on creating an exhibit with donated materials or fundraising to purchase the materials. Check out the “Fundraising Ideas For Your Witness Event” on our website. Golden Shields :To identify which Witnesses need to be created, you will want to work with your local SW Coordinator. In many cases, the stories for the shields have already been written. Each shield represents a story of someone lost to domestic violence in your community. For some, the actual wording will need to be created for the shield. Shields are approximately $50 each plus shipping and handling. An alternative to wooden Witnesses is to make them from cardboard. Some projects have made temporary Silent Witnesses out of cardboard or foam until they have been able to raise the money or generate the donations to create the permanent Witnesses out of wood. Prefer to Purchase Ready-made Witnesses Instead? For whatever the reason, if you would prefer to purchase witnesses already cut and painted, they are available for $125 from several sources. Click here to see where you can order them. An important requirement for creating Silent Witnesses is that the murder must be a domestic violence homicide with a conviction or pending conviction. The language used on the shield can only indicate the perpetrator of a DV homicide if it meets the criteria above. Stories can be researched through local news media as well as your local Attorney General’s office. Some states have this information available through the Attorney General's webpage but in many cases it requires some research on the part of the chapter or state organizer to write the stories for the shields. This is also a great opportunity to reach out to victim’s families. Depending on their healing journey, Witness families might like to be involved in your event. Many events create a storybook that has a summary of each Witness story. This can be a powerful tool to use during your event that serves as a reminder of how special each victim can be. Silent Witness has a template that you can download and have printed locally. Consider asking a local printer to donate the printing of the booklet, or see if a corporation will provide a gift to underwrite costs.